Residents of Pollokshields are invited to join us to carry out cleanup of back-courts. All residents will be encouraged to target their back-courts before moving on. In the past we were concentrating on Square Park and surrounding streets and now wish to expand our efforts. Those who are unable to make it to the clean-up, can you please inform your neighbours, if they have any bulk, furniture or anything else that needs to be disposed, please leave it on the pavement before 1.00pm this Saturday ONLY. As a part of our cleanup initiative, we have agreed with the Glasgow City Council that they will uplift on First Saturday of each month as a part of our cleanup. If residents leave bulk rubbish any day apart from our cleanup day it will be considered as Flytipping and there is £200.00 fine. If you are using MyGlasgow App that’s very good, if not please download it, would be good if you can try it. Here is step by step guide on how to report Flytipping, you can also use it to report Potholes, Missed Bin Uplift, Bulk Uplift Request and much more. I have plenty of Flyers and Neighbourhood Improvement Volunteers forms, please do let me know how many you need? 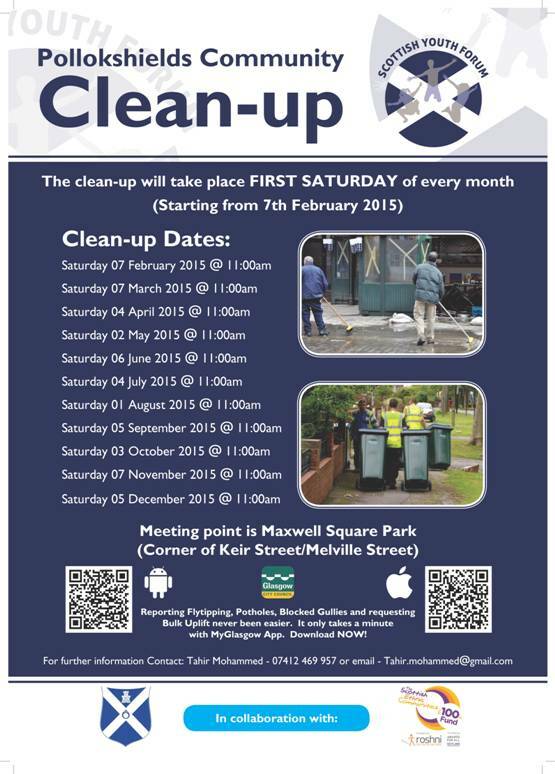 Just a polite reminder, Community Clean-up will take place on First Saturday of every month from 11:00 – 13:00. Please do join us.